Many corals may look like plants, delicately branching or with thick tree-like stems, but they are all animals related to sea-anemones and jellyfish. Some corals grow alone as individual polyps while others form colonies of hundreds or thousands of polyps. Over many years these colonies can grow to form coral reefs. 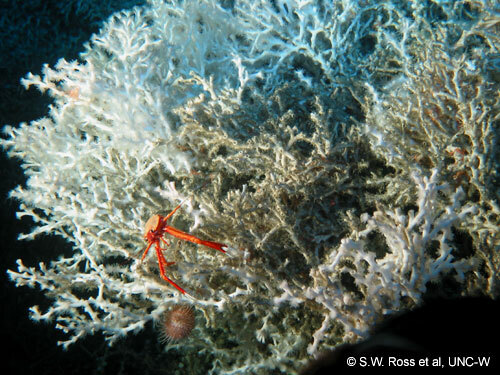 Cold-water corals come in many shapes and sizes from the stony scleractians to the bendy bamboo corals. Coral reefs provide a home for many other animal species and we are beginning to understand more about the biodiversity of these coral ecosystems - but we have only just broken the surface. Within the Corals pages, you can find out about cold-water corals, the different habitats that occur around coral reefs and the animals that inhabit these areas. There are also case studies of individual reef areas from around the world, with detailed images and breath taking movies.